For our first recipe, we bring you Herman’s Refrigerator Pickles! Pickles are something just about everybody loves. It is summer, and pickles go perfectly with grilled dogs or burgers. Or, they are great right out of the jar for a snack. Best of all, Herman’s Refrigerator Pickles are easy to make. Hell, even Denny can do it. The idea behind Fewd Snobs recipes is that they are easy to make, and damn good. That’s what being a true Fewd Snob is all about! These pickles are a little sweet, and a little tart. The brine gives the sweet flavor, while the onions zest it up a bit. The flavor is mixed enough to go with a variety of foods. And why is the word “refrigerator” in the title? Unlike many pickles, these don’t require canning or processing. They go right into the fridge, and they are ready to eat. Check out the recipe below. For a printable PDF version, click here. Optional first step: peel a little, or all of the skin off of the cucumbers. Slice the cucumber and onion into 1/8 to 1/4 inch slices, depending on preference. Place the slices into a colander over a plate or bowl. Add the salt, celery seed, and pepper. Toss everything together until evenly distributed. Pour the ice over the top and leave at room temperature for about an hour. This will draw moisture out of the cucumbers and onions and allow it to drain away. 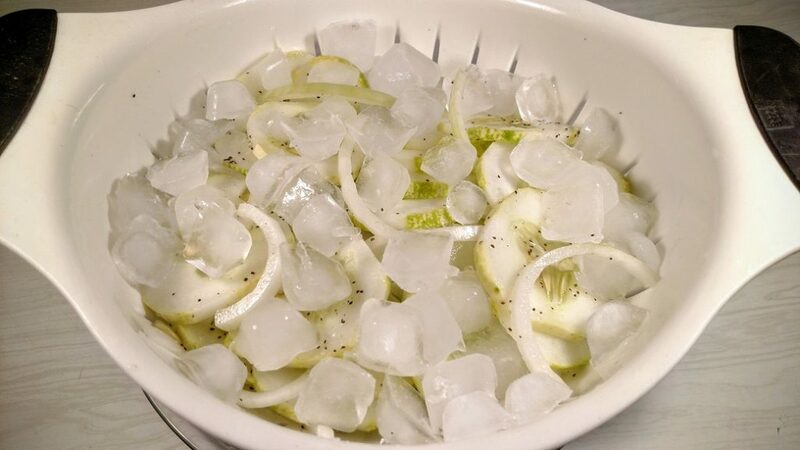 After an hour, separate the cucumbers and onions from the liquid and any remaining ice. Pack them into any suitable container. I typically use mason jars. Next combine the vinegar and sugar with a whisk until the sugar is dissolved. Pour the liquid over the cucumber and onions until they are completely submerged. If you need to make more, the ratio is 1:1 sugar to vinegar. Refrigerate the pickles for at least a couple of hours before serving. Yields about 1 quart. Keep refrigerated for up to 2 weeks. I’ve been looking at a lot of pickle recipes lately, (because I’ve finally decided it’s time for me to try it!) but your recipe is the first one I’ve seen that puts the slices in an ice bath. Does this help them stay crispy as well? I’ve seen a lot of people complaining that their pickles ended up too soggy, and I’m wondering if the ice helps with this? Believe it or not, yes. I do believe it helps keep them more crisp. 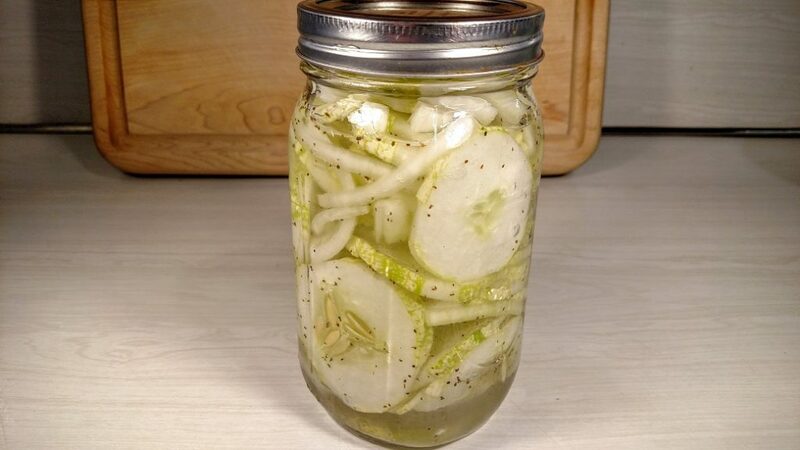 Thanks for the recipe, it is a great item for the summer when you get the fresh cucumbers from the backyard. 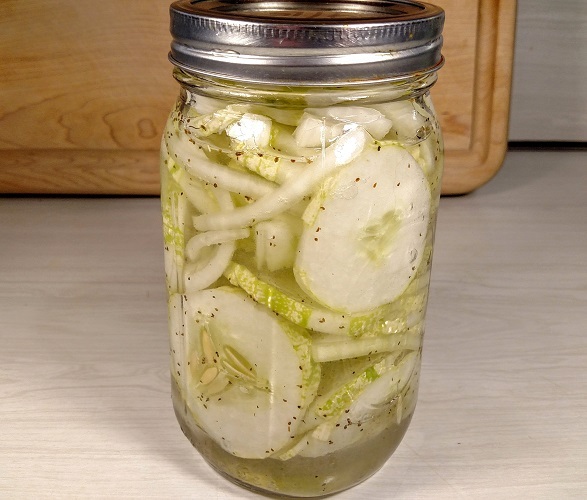 We make tons of bread and butter pickles all summer but this is so easy that I plan to make this my go to hostess gift when I get invited to a BBQ. ( Along with a bottle of vino) Just so much more personal. I’m also going to try this with vidalia onion since they are so good in the summer too.